Your vehicle’s exhaust system has an important job - it prevents toxic fumes from building up inside your vehicle and a working system will ensure that you receive the best overall fuel efficiency. At Babcock Auto Care in Rochester, MN, our ASE certified mechanics are experienced repairing exhaust systems on all makes and models of vehicles. As soon as you notice an issue with the exhaust system or you have failed an emissions test, bring your vehicle into the experts here at our shop. 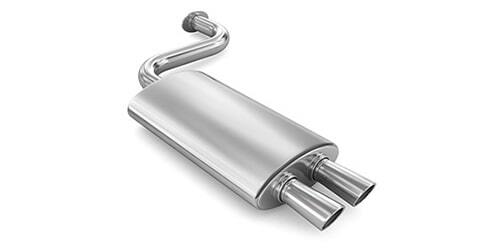 A problem with the exhaust system should be repaired as soon as possible and our professionals can help. When your vehicle runs, the engine emits harmful gases during the combustion process. The exhaust system will control and converts those harmful gases into less harmful ones to protect your passengers and also the environment. Problems with exhaust can be detected if the exhaust is suddenly very loud, is hanging, or you start to smell gas when your vehicle is running. A common cause of an exhaust system problem is a failing catalytic converter. The catalytic converter is the part of the system that converts harmful gases into less harmful ones. A faulty catalytic converter needs to be replaced as soon as possible and will prevent you from passing an emissions test.